The main focus this week was to get unique card backs that has been requested for quite some time. Another thing we wanted to do was fix some card bugs that have been in the game since the beginning. So we’re happy to be able to add some new features and also fix some annoying issues! If you haven’t yet, be sure to visit our sub-Reddit to upvote for your favorite requested feature or add in your own request. Unique card backs are now supported (each card in your deck can have a different back without merging). 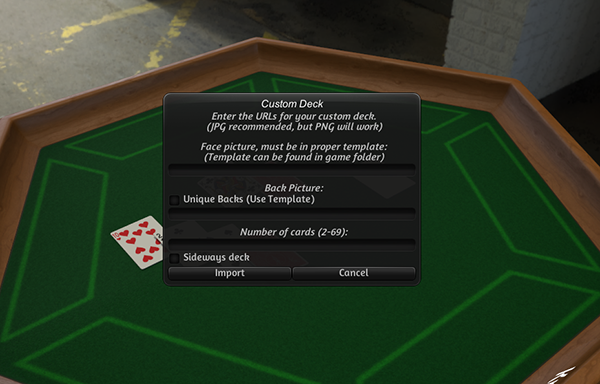 Select ‘Unique Backs’ in the importer, then place your back images onto the card template so they match their face image. 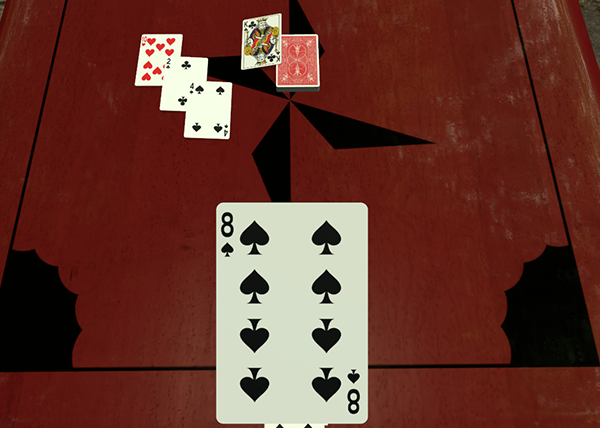 Revamped card slicing to be more accurate, so that pieces of card don’t visually bleed into each other. Alt zoomed objects will no longer be cut off on the side of the screen. Alt + scroll wheel is much improved and properly scales the zoom level. Alt + scroll wheel now zooms in the proper direction with up being zoom in. Fixed the flicker card bug for hosts (card would flicker when in a hand). Custom Model now supports normal maps (greatly enhances the bump and lighting on your models). Right Click/Contextual menu will no longer clip off the screen. Tutorial has been revamped with the new UI and updated to include the newer missing features. Improved smoothness of the controller’s pointer. Fixed issue with the contextual menu not working on Custom Dice. Fixed issue with white text/numbers on metal dice for clients. Fixed sideways settings for a single card not saving. Fixed issue with grid sync axis not saving properly by overriding to true. Fixed alt zoom messing up camera distance. Fixed rotation bug for held objects in green hands for certain tables. Stay up to date on our development by following us on Twitter and Facebook! 12/19/2017 – Update v10.2 New DLC – Tiny Epic Quest & Scripting Improvements! Update v10.0 New Networking, Updated Main Menu, Viticulture DLC expansions!